"Let CGF Brokerage and Consulting market your commodities for you. We are constantly in touch with today's changing marketplace." "CGF Brokerage cleans and donates all submitted pulse samples to the Saskatoon Food Bank on behalf of our producers. Thank you." 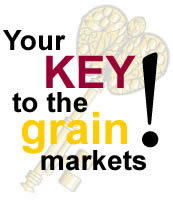 CGF Brokerage and Consulting now has listings for seed grains. Simply choose "Services" from the CGF home page, then "Seed Listings". Choose the commodity and sample number to see the details. Important News for Barley Producers and Buyers! CGF Brokerage & Consulting is proud to announce that we are fully equipped and trained to analyze barley for malt. For producers this means that you now have a fully trained and unbiased option for getting your barley analyzed for malt and access to multiple buyers to move your commodity. Follow this link to get some important information regarding quality factors in malting barley. CGF Brokerage & Consulting has been a ground-breaking company in the industry by always introducing new and exciting opportunities for producers and buyers. August 1, 2007 was a historical day for CGF Brokerage & Consulting as this innovative company offers a new service in the grain and freight-trading market – CGF eTrade. CGF eTrade is essentially an online trading market for buyers of grain. With our electronic trading you will now be able to place bids for your desired commodity online at CGF Brokerage & Consulting’s website. The electronic trading application is a real-time auction with a predetermined end date and time. If you are interested in purchasing access to this exciting opportunity, contact the office at: 1-306-244-1124.